… why I love David Conrad. With Consol Energy Center having finishing touches put on it, there’s quite a bit of debate happening here in Pittsburgh about what should happen to the Igloo. Chad Hermann basically annihilated that theory like it was the world is flat theory. There is a grassroots effort that is really gaining steam thanks to The People, who believe the Igloo should be repurposed and celebrated for the history it holds within its retractable dome, which by the way, I have never seen open in my life, except for the movie Sudden Death. I think I was really on the fence about this issue, because, well, the building is old, and do we have to save EVERY old building and wouldn’t it be nice to redevelop that area? But Chad’s post really pushed me over the fence onto the “keep it” side. 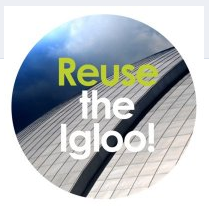 Good Morning Reuse the Igloo Supporters! A number of things are happening behind the scenes! We have received a challenge grant of $7,000 from the actor David Conrad (CBS Ghost Whisper and a great supporter of Pittsburgh history architecture and culture) to commission an independent economic assessment that will challenge the incomplete and biased study by Oxford Development. We will set up a page for donations for the match. Even if your gut tells you we should tear it down, you’ve got to respect the commitment he’s making to at least making sure all the facts are uncovered so that the right decision is made. All right, between this and this and now this, who among you still doesn’t count yourself as a fan of David Conrad’s, or will I simply know you when I see you shoving sweet old ladies out of crosswalks, you hater of awesome people? I’m glad to hear the issue of saving the, um, Civic Arena (or as a friend liked to call it, the “Fritzie Zivic” Arena) is picking up steam. Apparently Mr. Conrad sees the building as many of us do: An iconic structure. It is not the sole defining element of Pittsburgh, but it certainly is a major one. The retractable dome is exceptionally unique, and I’ve had the pleasure of cool summer air blowing on my neck when it opened during encores of performances by Chicago and CSN. I’m with Pa-Pop. Completely. It almost reminds me of the small wall where Forbes Field once was in Oakland. It’s hard to even imagine a field being there. I’d hate the same to be for the dome. Now, if they tore down Mellon Arena and then built cheap housing over top…what will that really do? I would love to see it around for the ages. For a lesson in how far this movement will get, see what happened with Tiger Stadium in Detroit. This is probably already a done deal, and remember that LeBurkle have a say in it too, you hero-worshipers. I agree with bucdaddy that it’s probably already a done deal, but I hope I’m wrong. As I was walking up to the arena last week, I was thinking, ‘there will be nothing else like this again if they tear it down.’ While I don’t know how practical re-use is, I would like to see a study by someone other than the development company that reached a rather predictable conclusion. I’ve been really unsure on this too. My head wants whatever is the best thing for the area, and I am not an economist so I can’t work out for myself what that would be. But my heart is completely dedicated to keeping the Igloo around. So I’m definitely in the camp of “really genuinely explore all options.” Even if a clear unbiased just-the-facts take shows that tearing it down is far better than leaving it up, I will cry to see it come down. Knowing the Pens needed a new arena is so not the same as being happy to watch the old one go. Of course it is a done deal. The 10 minutes of “listening to other ideas” they did was all for show. All sorts of back scratching and kick backs going on and a youthful mayor who wants to say “look what I built” and doesn’t have the backbone or experience or wisdom to say, “look what I saved and reused.” I am all for progress and new construction and development. But not when there are other options and especially for something as iconic to the city as the Civic Arena. As much fun as I have had there, I must say that I won’t be sad in the least to see that arena torn down. Well I might be bummed a bit until the second that I step into the new arena, sit in my seat and not be sitting on top of the person next to me. I just don’t see the benefit of leaving it up; what is everyone’s reasons for not wanting to tear it down? I am genuinely curious. We can keep the Igloo intact if we can finally tear down the weed-choked St. Nicholas church along 28 North that has been sitting there for years deteriorating because it is considered a “treasure”. First retractable roof casino in the world? Absolutely love the Arena and cherish every memory in it, but I’d also like to hear (just 1) feasible re-use idea. That land will be too valuable next to the new arena to let an unused dome sit in ruins (and waste taxpayer $ to maintain). If there’s a viable re-use idea, I can see myself getting behind it, but what is it PG? I would love to know what they’re planning to do with it. The place is a dump. It’s a dump with good memories, but a dump nonetheless. While the outside architecture may have been unique to the time, the inside would probably need to be gutted for the venture to be profitable. If there is a viable way to keep it up and make it profitable for the city and the team (which I believe will be getting a cut of whatever development goes in), I’d be willing to listen. However, when push comes to shove, if new development means more revenue for the team, and that much better of a shot of putting a good product on the ice, that far outweighs the Igloo’s sentimental value. Besides the nostalgia of, “Gee we had some good times there” and the fact that we’re all enchanted by the fact the roof can (but never does) open, what is the value of perserving this structure? It’s outdated, completely energy inefficient and sits on a plot of land that could be redeveloped and really add something terrific to that corridor of our city. Remember when the North Side was nothing more than parking lots around a stadium? Now it’s the “North Shore” where a lot of business, jobs and attractions contribute to our city’s economy. Please know, I’m not criticizing those who want to keep it. I’m just sharing my opinion that warm and fuzzy feelings shouldn’t get in the way of continued re-development of America’s most liveable city! @Me #10: Three Rivers looked just like a lot of other stadiums. I can’t think of anything else like the arena. The other thing is, the new arena is looking rather bland from the outside and maybe the ‘save Mellon’ is a reaction to that. If it stays or goes it won’t matter to me. I have really great memories of events there, as well as some bad ones. I loved when PPG sponsored the summer concert series with tables set up on the floor and the roof would be opened. There were some perfect summer nights. I think it was early 90s when the new scoreboard was installed during the filming of Sudden Death that resulted in the roof no longer being able to be opened. LucyLou, nostalgia isn’t part of this; if it was, the demolition of Three Rivers would have been met with the same reaction and it very much was not. The Igloo’s architectural uniqueness (not just the roof’s former retractability, but the very “igloo”-ness of the building) gives it the makings of a true landmark. People see that building and they know they’re looking at Pittsburgh. There is value in that, and we just want to know for sure if there’s a way to keep it that’s economically worth the effort. I can’t imagine anyone would honestly argue that we should keep it damn the consequences (look how many of us spent years in support of dumping it for a new arena to keep the Pens in town), but there is intrinsic value in trying to preserve things that are part of the very fabric of the city. If keeping it can’t work, it should be brought down, but mostly people just want to feel comfortable that every reasonable avenue has been explored before a final decision is made (although I do feel that the decision has already been made). Sorry – but it is an eyesore. Why not use at least part of the space for a park – someplace nice to walk – something the city, especially this side, really needs. 3 Rivers Stadium was a concrete ashtray like so many Father’s Day gifts crafted out of clay in kindergarten. So comparisons to the Arena are simply not relevant. Architecturally, it is indeed iconic as someone already said. If the dome could be opened again – my understanding is it can’t be chiefly because of the weight of the scoreboard – you might really have something that could be developed for combinedindoor and outdoor use. Study that with sincere purpose and brain power, not just politics. The idea to reconnect the Hill to downtown strikes me as so much rhetoric to appeas Hill leaders that spoke out agains Consol Center. Besides, the next time Lukey, Onorato and Spector selflessly have the city’s best interest at heart will be the first. Disclaimer: I’m biased. I have 2 historic preservation degrees and another in architectural history. Whether or not an individual finds a structure appealing to their personal aesthetic has no place in the discussion of the viability of that structure as a landmark. For that matter, even if everyone on the planet thinks it’s a godforsaken eyesore, that alone is not a compelling argument. Or actually, I suppose it would be a compelling argument. For keeping it. “I think it’s ugly, tear it down.” is an argument that, obviously, centers around opinion and the ever-elusive and controversial matter of “taste.” And that argument will never go anywhere, because it’s irrelevant. What *is* relevant is considering how the building fits into our urban fabric, and the significance of the architecture and engineering no matter how much you might prefer a Cheesecake Factory standing in its place. The Igloo — and all structures, really — are physical records of culture, whether they are constructed to house people, governmental bodies, sports, etc. They are valuable resources that deserve consideration for their physical form, for what they represent currently, and for what they say about the people and times who constructed them. And once you tear them down, they are lost forever. I agree that the “reconnect the Hill with downtown” is a ridiculous idea. That the Hill is not separated from Downtown by some sort of impassable Berlin Wall. That politicians such as Rendell, Onorato and Lukey support the “reconnection” because it really means construction development and therefore money in their campaign coffers. However, that does not mean that “saving” or “preserving” the Civic Arena is a good idea. Or a feasible one. The place is falling apart, the roof may be able to be opened, but no one is sure if it will close again. There are costs for upkeeep and maintenance. The Igloo is in need of major renovations. On a recent sports talk show, it was stated that just opening the arena for one event costs $250,000. That’s ushers, vendors, heating and cooling, water and sewer, electricity, security. Who will pay the tab to keep the thing open as a museum? At a Pens game I attended this season (Buffalo in March, I believe) there was water leaking from the ceiling in the main concourse. A very steady downpour. From the bathroom above perhaps? I don’t think David Conrad’s $7000 will cover all of these costs to keep it open. And do we really need to commission another independent commission to look into the viability of sustaining the thought of forming an official commission to waste more tax dollars on making a simple decision? One of the things that keeps Pittsburgh from moving forward is it’s refusal to let go of useless buildings. Some things should be preserved. The Fort Pitt blockhouse. The wall from Forbes Field. But these buildings or structures are small enough and require considerably less maintenance and cost to upkeep. The Igloo is too big, too expensive and will become too dangerous. I have great memories from the Igloo. Playoff runs in the 90’s and 2000’s I’ve been lucky enough to get tickets for. The first time I saw Pearl Jam in concert. Duquesne-Pitt basketball games. Duquesne hockey games. And I remember as a very young kid going to the old Pittsburgh Folk Festival at the Civic Arena, when they could open the roof! Those are great memories, but it is time to move on Pittsburgh, and build new memories. We can’t keep everything in the attic, basement and closets. Sometimes you have to do some cleaning and throw things away. But you can keep the memories. And bore your kids or grandkids to death and tell them about the time little Austin stood at center ice and watched his dad’s number being lowered to the ice when he returned from retirement. Are we keeping it for reasons of nostalgia or simply as a shape on the skyline? Is that worth what it would cost to make it commercially viable? I’m all for doing more studies on various proposals, but if Yankee Stadium didn’t deserve to be kept around for historic reasons, this cement cereal bowl certainly doesn’t. What’s important is to get tax-paying, job-producing, quality-of-life-improving entities into that area. Not propping up a relic of the seventies. My disclaimer: 2 architecture degrees, and I love adaptive reuse of buildings. I would recommend that everyone watch this video from CNN which details the remodel of Palmer Auditorium in Austin, TX – a building that has a familiar look to the Mellon. What on earth are they going to re-use it for? There is a state-of-the-art arena 100 feet away. Civic Arena is rat-infested, the facilities are sub-standard and it’s difficult to book shows tours there now because of the health of the building. No tour manager in their right mind is going to want to book a show there once the new arena opens. I have many memories in the igloo – I’ve been in it when it was opened, saw the Stones there in the 60’s when Mick was shocked, saw Michael Jackson too on his only visit here, circuses, and many, many hockey games going back to the Hornets. I love history and this city and for the life of me, I still can’t imagine why people want to save the igloo for community ice rink. It would get little use, just like the ice rink at PPG, and cost a fortune to maintain. That’s the kind of pie in the sky thinking that’s just too expensive. Unless we can come up with a better use, tear it down and use the area to better serve the surrounding area. I think many of you are missing the point of the proposed reuse of the building. I don’t think anyone is proposing that it stay the way it is and be reused as a similar space. Most of the plans I have seen call for gutting the inside, opening it up, and using the shell for something new like retail, hotel, a park, public skating rink, and amphitheater. Look at some of the links or artist renderings from the Facebook fan page in this blog post and it might give you a better idea of alternate plans. I wonder if the Mayor, Arlen Specter and Dan Onorato, are thinking about the terribly unfair hardships that many residents of the Hill District had to endure when their homes and businesses were taken from them for the sake of building the Civic Arena. The Civic Arena (which it will always be to me) is unique, and tearing it down would be a crime. Yes, it’s getting old. Yes, it’s going to be costly to maintain any longer. But… a fifty or a hundred years from now, people will gaze at pictures of it in wonder, thinking to themselves what fools everyone was in 2010. There MUST be some way to preserve it. I understand the feelings of people in the Hill District, and agree with them to a point. But the arena isn’t East Liberty, it’s a different sort of problem that can’t be fixed and restored. Is it possible to move it? I have no other ideas to offer, but it will be a sad day for Pittsburgh if it’s destroyed. To those in the above posts that say there is no alternative use please look at my website ( there is a lot of substantial study) I have 30 years experience in architecture and planning, so when someone says it is unrealistic, I have to ask do you believe someone who has the proven track record as an architect and planner, knows the history of the Hill and what the arena symbolizes to SOME. Why should a bunch of exjocks and supermarket have the final say on our cultural assets? We the citizens of Pittsburgh do. The question then is HOW? 1. Delay demolition for 5 years, but that does not mean having the Igloo sit there. Unlike any other building in the world, its roof can be opened and we can use the proposed demolition process to gut the interior seating bowl all the accumulated construction of the last 50 years. This would happen anyways.This would cost about 3-5 million out of the so called infrastructure funds from state and federal sources. 2. Use the remaining demolition funds (another $3-5 million) to create the basic park surface around the old rink. This would create an IMMEDIATELY useable park space along with a functioning rink. This could all be done in the same time frame planned for demolition in 2011. With the building reconfigured for public use as a recreational space, we could go to work on marketing the available space under the fixed portion of the dome (under the truss). People and developers would able to see the potential for themselves with little additional cost other than the repurposed demolition funds. 1. The economy (and bank lending) is so slow that new development on the Arena site proper other than parking lots is highly unlikely. 2. If no developer could be found with in an agreed upon timeframe ( I would propose 5 years). Two explosive charges at the base of the truss would bring the rest of the dome down. Of course, I believe that people would be so blown away by this structure as a round park with an operable roof that it would convince the development community and the Hill that it is worthy to develop around it rather than take it down. JUST GIVE US A CHANCE TO PROVE IT! Delay it for 5 years????? Are you serious Rob? Come on, it’s an eyesore and it’s a highly inefficient building. I can understand your interest. Like all architects, you have an ego. You want to be involved in the design of a renovated facility. So I can’t really blame you for wanting to profit and getting people behind you. But how about just re-using the parts for other projects? That would make the most sense.